Through snow piling up across the Lower Mainland, families braved the cold last weekend to join us at ArtStarts on Saturdays in Vancouver and ArtStarts at River Market in New Westminster, to join storyteller Shayna Jones, of WeAreStoryFolk, for the FolkPlay program. Shayna’s unique storytelling style blended wisdom, rhythm, song and movement delighted young artists and adults alike with a variety of her wonderful stories. Shayna introduced herself, after some group singing to warm everyone up on such a freezing morning, by describing her role in two of the most important jobs in the world: storytelling and motherhood. The stories she told were deeply rooted in the perspective of a mother looking to guide and care for the children around her, and pass important lessons on between generations. Her stories spanned not only time, but culture as well. Shayna brought two stories to share with the families that had genesis all the way in Sierra Leone. Being careful and protecting oneself from danger was the theme of the first story. As Shayna wove a tale of a village of mice being preyed upon by cunning cats and the virtues of listening to the advice of one’s elders, she brought the story to life by dancing and running around the stage. Feeling comfortable with oneself and not growing up too fast was the second lesson Shayna gave to the young artists in the audiences. A fable of a child who use their magic word (“Cucumber!”) to transform themselves into the beings they saw as more powerful than themselves, only revealed in the end that a child can be powerful all on their own. 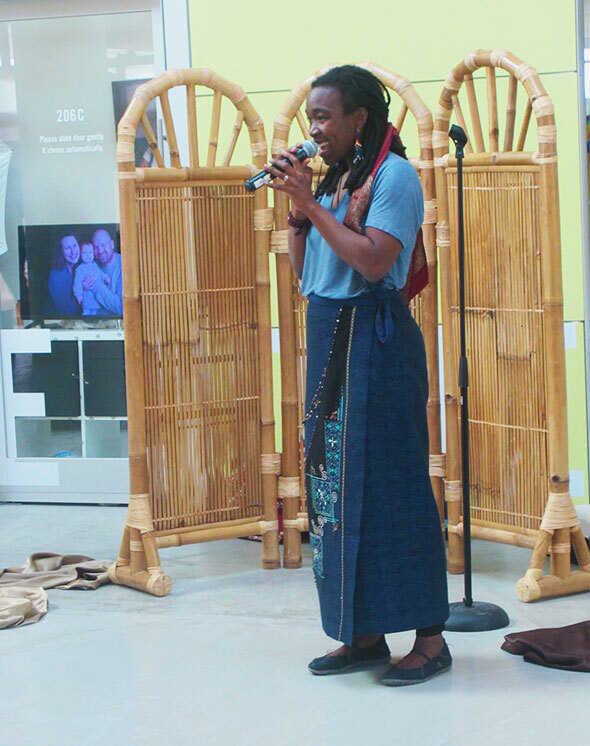 Shayna’s warmth and expert storytelling worked to inspire young people through art! We are thankful that she could join us for ArtStarts on Saturdays and ArtStarts at River Market. Next month at ArtStarts on Saturdays and ArtStarts at River Market, Project Soul presents an energetic, skillfully, dynamic street dance show combining freestyle and choreographed routines. The show brings theatre and dance together covering various topics that are relevant and relatable situations to everyday life. Throughout this lively show there is audience interaction and even a chance to participate and try out your own dance moves. Join us on March 31 and April 1, for complete details, click here! Also check out ArtStarts Explores, our brand new drop-in workshop series for creative and adventurous families held from 11am to 12pm most Saturdays.